I took a yoga class. And more than once — I went back a few times and really worked on my mental health while at the gym, not just my physical health. Doing this made me realize how much I was neglecting my mental health needs. Meditation and focusing on your breath increases brain function in its entirety, while improving mindfulness, your mood, and the ability to focus. While at the same time, reducing stress. And even though I didn’t understand half the words that were spoken by the instructor, I just mimicked the elderly people on each side of me to get through it. And yes, I purposely positioned myself between two older people, thinking it will make me feel better than standing next to some well seasoned yoga enthusiasts. But they were both well seasoned. And instead of being discouraged, I became inspired. Look at these amazing bodies, stronger and more flexible than I had assumed they would be! I was most surprised at how sore I was after the class. Who knew holding a position for a few breaths would be such a workout. But the best part was that I felt like I didn’t just get a physical workout, I got a mental one too! If there’s one thing that really resonated with me about the class (and really, the only part I understood), was at the end while in tree pose. While in this position, we were instructed to imagine our toes like roots, becoming one with the earth and strengthening your foundation. Then we lifted our hands above our heads, imagining the growth and change within our tree and the strength that keeps us grounded in the winds of adulting (my words). Once I was standing tall, with my roots strong and hands above my head acting like the branches of my growth, I was instructed to reach my arms outward, growing my tree and finding balance in the wind. That’s when it hit me. I was struggling to find balance in the wind. Trying to be the best at everything I do, had me feeling less than adequate in most of the areas of my life. So I have started to focus on the root of it all (couldn’t help it- I love puns!). I am focusing on feeling more grounded, feeding the roots of my tree by cultivating self-love, stability, and a sense of self-security. I want to grow my tree strong by meditating more often, strengthening my relationships with those closest to me, and taking the time to put self care into each and every day. I hope that reading this, you are inspired to work on your own self care and mental health. That you dedicate some time to strengthen your own roots and grow your tree. Growing my tree out at the Sonoma Coast. 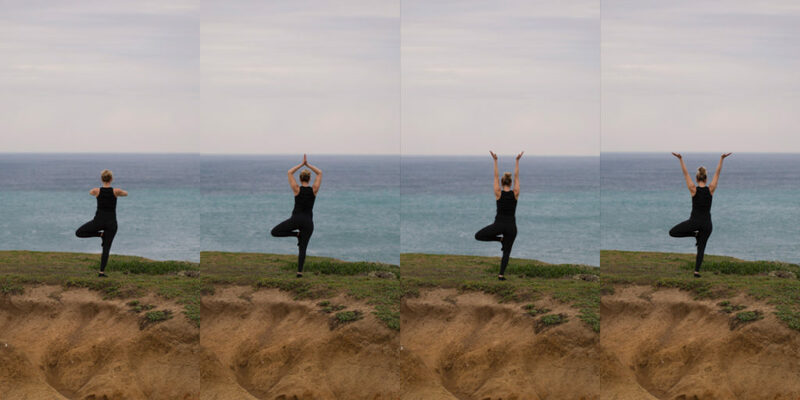 These photos were taken by my amazing daughter, out at the the Sonoma Coast. We almost didn’t go to the beach that day, but I am so glad we did. Healing happens there, and I plan to spend more time at my “happy place” this year! Where is your happy place? What actions do you plan to implement this year to improve your self care? I think most people who know me would agree that I am pretty dorky, genuine, and down-to-earth. I am passionate about helping people and making a difference and love to do that through my photography. I’ve been called a “confidence whisperer” for helping people with their fear of being in front of the lens. It excites me to offer an experience that helps people appreciate and love their originality, enabling them to love and respect who they see in the mirror everyday.